Please note that in this post I am speaking in general terms about events like 9/11, but I do not at all wish to detract from the very important duty held by every American to remember the brave and courageous individuals who chose honor over life on that day, and on many days like it, throughout our nation's history. Their legacy should be treasured and honored by every one of us. What exactly is it that we remember on September 11th? What is it that we constantly remind ourselves and one another to "Never Forget"? On September 11th, this year, I received a soundtrack I had ordered; the music from the film United 93. On the back of the case, the dedication is begun thus: "This music is a prayer for peace..."
And I am left to ask- a prayer to whom? I love America. But in times like these, it is worth asking- what is America? I love America like Maximus loved the dream that was Rome. America represents so many wonderful and precious things, and for years has been the bastion of Christian civilization- a city on a hill sending the darkness into terrified retreat before the light of freedom, truth, and law, all of which stem from the Holy Word of God. And I love those things. I am, by God's grace, ready to die for those things. And I love the dream that was America. And I am ready to die for that dream. But America is not what she used to be. Shackled by oppressive government, muzzled by political correctness, and, worst of all, gradually succumbing to a cancer of the soul, America is dying the long, painful death of a nation whose sturdy foundations are slowly crumbling beneath the deteriorating shambles on top. And all the patriotism in the world, all the bumper-stickers and troop-supporting and #neverforget- they are powerless to change that fact. Electing Romney instead of Obama might stick some bungee cords on the burning wreckage, but in the long term it is all coming down anyway. So when days like 9/11 come up, and the cries to remember and the cheers for the American spirit and all the happy hoopla and empty jingoism of today's great American facade explode across social media, I find myself at a loss for words. The true patriot, it has been said, will not say "my country, right or wrong." He will say "my country- when right, to be kept right; when wrong, to be made right." Real patriots are honest, not blind. So let's be honest. - Islam (and it's not radical Islam; it's true Islam) is on the rise, flexing its tyrannical muscles and slashing and burning and beheading as it marches over lands protected by Crusaders and forsaken by their children. - The entire political structure of our nation has hit a point of self-perpetuating implosion. The economy still has some foundational pieces left, creaking and groaning under the weight of tyranny, and weakening from within because of the rot of moral decay; it is only a matter of time before Atlas shrugs. - Christendom as a whole- Western civilization, the beacon and anchor of the prosperous world- is committing a convenient suicide, slaughtering millions of their own children and "controlling" the rest from ever entering the world. We may say with pride that no enemy is necessary; we have found a way to dwindle ourselves into nothing on our own. If Islam weren't such a bloodthirsty religion, they could wait a few years and rule the world anyway, given the drastic multiplication of their families and the rapid subtraction of ours. Meanwhile, the Church of Jesus Christ has largely forsaken His Word, throwing the Lion of Scripture into the cage of dispensationalism, retreating from the head of the culture to pass out Gospel tracts among those at the tail. Judgment starts in the house of God (1 Pet. 4:17), and when we look at the nation we, the Church, have built for ourselves, or rather destroyed for ourselves, this truth should make us tremble. For "culture is religion externalized," and the culture of America is American Christendom externalized. To return to my newly acquired CD, the "prayer for peace" is representative of the broader state of "good-ol-boy" religious America. We're a big fan of "God," though we're generally pretty good about being ambiguous as to his identity, and we hope "God" blesses America, and we send both prayers and good feelings and thoughts to our neighbor in need, and our politicians are good church-going folk, and we are all happily happy in our politically correct mess of religious pottage. Oh yeah, and we pray for peace. Problem is, this world is a world at war. Since the fall of man it has been the children of the woman against the children of the serpent. Peace is a wonderful thing, but true peace will only happen after complete victory. Until then, we need to keep the Crusader cross painted bright across our shields, our swords sharp, our arms strong- both physically and spiritually. Spiritually, for offense, for the Gospel will conquer (Matthew 16:18); physically, for defense, for the godless will kill (Proverb 8:36). Islam will not hesitate to behead me, or you, or our loved ones. Humanism generally prefers something more sterile, like abortion, or gas chambers, or euthanasia. Socialism is happy just to kill the society and leave everyone in it to scrape out whatever existence they can. But they're all at war against Christ. What is the solution? Violence? No! Not at all. Christians should be ready to take up physical arms and shed real blood in real battle if the time comes where they must do so in defense of the innocent. But Christianity, unlike Islam or Marxism, was never to be propagated by the sword. The solution is to fulfill the two primary missions of Christendom- the Dominion Mandate, and the Great Commission. Be fruitful and multiply; fill the earth and subdue it; go therefore and make disciples of all nations, and teach them to observe all- all- that Jesus has commanded. We must have kids, and teach them. We must love people. Preach the Gospel. Live the Gospel. Grab a trowel and spread the Gospel thickly into every little crack and cranny of life. Make disciples, not just converts. Run for office, and make Scripture our platform. Vote according to Biblical principle, not just conservative ideals. Engage the culture. Make the movies, write the music and the books, paint the pictures, tell the stories, take the helm for the Glory, by the Grace, and under the Word of Christ. The gates of hell cannot prevail against the faithful Church of God. So if the gates of hell are prevailing, then we need only look at ourselves. How are we failing in our duty? There are a few that come readily to my mind; a few gaping holes in the walls of Jerusalem that the reformer-Nehemiahs of today have the opportunity to repair. - We are ashamed of God's Law, and we are afraid to bring The Bible into the political realm. We have a cart-before-horse perception of the "separation of Church and State," and it has rendered the Church's influence on American politics largely impotent. - This has left us, politically, advocating a spayed-and-neutered "conservatism" which tries to adhere to a form of Godliness while denying its power, which is God's Word; the result is just a cleaned-up humanism which, rather than warring against the advance of the realm of darkness, jumps into its sandbox in hopes of slowing its progress on the tower of Babel. - We have a truncated view of the Gospel. Instead of a multi-generational, dominion-taking, life-and-world-changing Message, we have reduced It to a matter of "praying a prayer," going to church on Sundays, and exchanging swear words for bywords. We have made the Gospel into an invitation to a party instead of a call to war. - Maybe that's the biggest thing. I think we've lost sight of the antithesis. We've so highly spiritualized Christianity that we struggle to see Its ramifications for the myriad speculations and lofty things raised up against the knowledge of God which swirl around us day-in and day-out. Until we realize that we are in the war, we will continue to lose it. The movies we watch, the food we eat, the jokes we tell, the very way that our children learn math- this is all part of the war, and we must learn to identify it as such and take it captive to the obedience of Christ. 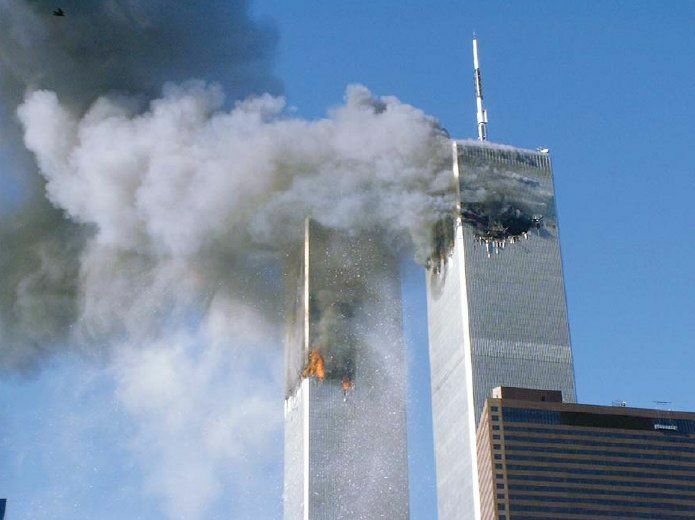 The twin towers were a symbol, and their fall was also symbolic. Prophetic, even. That is America's future, unless we repent. So when we remember the tragedy of September 11th, let us not remember it with the pride of a nation of overcomers looking back on another trial we have surmounted. Let us remember, and shudder, knowing that, unless we repent and return to the ways and the Word of God, that was only the prelude to the nightmarish symphony that is the future of America. P.S. There is hope. Lots of hope. God is doing amazing things in our country, and I'm excited to see His Hand moving and reforming and building the new even as the old collapses around it. But hope is to be found in Christ, His Word, His Church, His War- not in conservatism or patriotism as an ideal apart from Him. And that, in a nutshell, is the entire sum of what I'm saying with this post! This is superb. Thank you, sir.